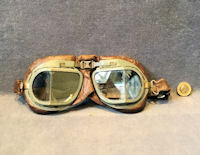 Original, quality pair of Second World War Pilots' goggles with grey painted frames on padded leather mounts in super condition and complete. The elasticated strap is weak but still usable. 8" x 3.5" tall and 1" front to back. 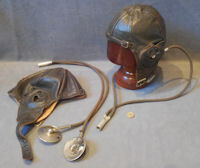 Original, quality pair of pre war leather flying helmets complete with ear phones and flexible hoses. The leatherwork is in super condition and in a grey/brown colour. 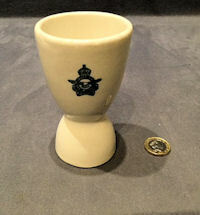 The interior is lined in a chamois leather, and both have embroidered labels to the inside detailing "Sherwin's of racing, flying and motor clothing fame, no connection with any other firm, 27 Carburton St London W. I Tel Museum 4793." 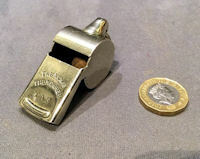 One also has a label for the size "7 ¼ ". Each chromed circular earphone is impressed "D.H Type Earphone." 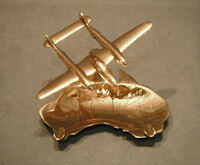 DH= De Haviland Aircraft. All is complete and in good order with no tears, holes or missing buckles, etc. The hat block is not included in the price but is available Ref Code: HB1. Tubes and Earphones 26" long. Earphones diam 2.75". Hatblock in picture 11" tall.